The Faculty of Business holds a unique position within the province’s education system. As the only university school of business, it is committed to intellectual leadership, and to excellence in developing new knowledge and conveying that knowledge to its students and to the public. In order to attract, develop and retain students, faculty and staff, the Faculty recognizes that it must sustain an intellectually stimulating environment. The Faculty views its students not as customers, but rather as partners in the development of a high-quality business education. Graduates are expected to have developed competency in integrating the core functional business disciplines; ethical, social, historical and global awareness; critical thinking and problem-solving; quantitative analysis; communication skills and leadership; teamwork as well as a personal initiative; technological application in business; and using business research to support the evidence-informed practice. The degree program in the Faculty of Business is designed to fulfill this mission and to provide the educational breadth and depth needed by business leaders. The courses and experiences related to the specialization in entrepreneurship provide students with the knowledge and the experiential learning to start up a business or manage one in an entrepreneurial manner. Students will study the various types of entrepreneurship including business, social, and innovation within existing organizations. The key learning outcomes for students will be to gain knowledge, confidence, skills, and practice in both entrepreneurial thinking and leading entrepreneurial initiatives. They will think analytically, ask questions, research the market, solve problems, start a new venture, launch new products/services/ideas, and develop other entrepreneurial skills. Management of financial resources is critical to the success and sustainability of both private and public organizations. An understanding of financial concepts, qualitative and quantitative problem-solving skills, and rational decision-making practices are important learning outcomes of the courses in the specialization in finance. The courses in the specialization in finance focus on both corporate finance and personal finance with the intent of preparing the student for a career or further education related to finance. The international opportunities in today’s world are vast. Doing business internationally is also challenging. The specialization in international business includes four business courses that provide an overview of those opportunities and challenges, as well as five electives to be chosen from a large multi-disciplinary set of courses that can enrich a student’s understanding of the world beyond our borders. The specialization also includes an international exchange term or an international work term. The Bachelor of Business Administration degree with a specialization in marketing is designed to introduce students to the core marketing function within the spectrum of business and further develop students’ theoretical and practical understanding of a full range of marketing activities. In addition to the core business curriculum, students pursuing a marketing specialization will take courses dedicated to marketing communications, brand management, market research, consumer behavior, personal selling and sales, and international marketing. The marketing specialization is intended to help prepare students for entry-level positions in both small and large organizations ranging from account managers to marketing coordinators to brand managers and much more. The leadership and management of organizations can promote or undermine organizational effectiveness, the well being of organizations’ members, and outcomes for other stakeholders. 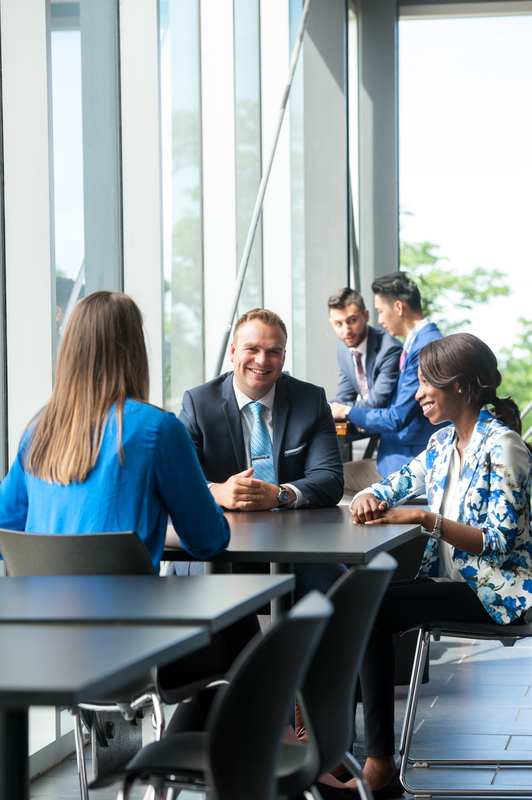 Management-related courses such as organizational behavior, human resource management, and leadership and management skills are important components of the core BBA program. The specialization in organizational management allows students to delve deeper into the broad, interdisciplinary domain of management and organizational studies by combining additional management courses with relevant courses in social science and liberal arts. Substantive issues relating to organizations as well as social and behavioral research methods are features designed to help students take an evidence-based approach to management. This specialization promotes the development of thoughtful, ethical, and productive members, managers, and leaders of organizations. The Bachelor of Business Administration degree with a specialization in tourism and hospitality is designed for students who plan to work in the tourism and hospitality industry in a management capacity or as an entrepreneur. The specialization in tourism and hospitality includes four required courses that focus specifically on the tourism and hospitality industry, as well as five electives to be chosen from a large multi-disciplinary set of courses that can enrich a students’ understanding of international business and international peoples. The new curriculum added four new specializations - namely finance, marketing, organizational management, and tourism & hospitality. These new specializations are in addition to the three specializations that had previously existed: accounting, entrepreneurship and international. The required courses for the BBA were modified, and several course numbers were changed to reflect the schedule of the new curriculum. The new curriculum applies to all students who began the program in September 2014 and to all students who begin the program after that date. However, students who began their BBA degree before September 2014 may be able to benefit from these changes too. An Honours concentration in Business Administration provides an opportunity for BBA students to pursue advanced studies in Business. It is available to students with a strong academic background who intend to continue studies in Business at the postgraduate level, or to students who intend to pursue a career where research experience would be of value. For admission to the Honours program, students must have a minimum average of 75% in all previous courses. Permission of the School is required and is contingent on the student finding a faculty supervisor. Students interested in pursuing the Honours program should seek admission as early as possible, not later than the end of the third year. A total of 126 semester hours of credit is required for the BBA Honours. In addition to the requirements of the regular BBA, Honours students must complete Honours Thesis 510 (six semester hours). This thesis would normally be completed in the semester following Business Research 4950. A committee of three faculty members, including the supervisor, will review the Honours thesis. An oral examination conducted by the committee will also be included in the evaluation process. A minimum average of 75% must be maintained to remain in the Honours program.